Random Lengths Yardstick - Fastmarkets RISI - Objective Insight. Better Decisions. 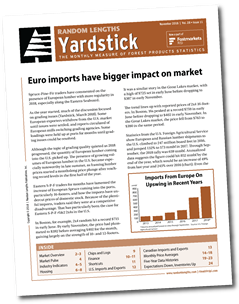 Yardstick is a monthly big picture of the North American wood products industry. It provides you with key figures, charts, graphs detailing more than 60 key economic indicators, along with hundreds of other statistics packed into easy-to-read tables. Market overview provides a clear picture of national economic and forest products industry trends every month, with an at-a-glance look at where the market has been in the past month, and how current conditions compare to year-ago levels. Includes key price indicators from the Random Lengths weekly report. Product and species composite prices show a broad measure of price movement, tables and graphs of monthly averages that allow you to measure price trends in 14 specific product groups and species composites. Industry indicators and market pulse show the month’s production, orders, shipments, and inventory levels compared with year-ago figures. Feature story covers news and trends affecting the industry and the markets. U.S. housing reports show actual starts, single-family and multifamily, SAARs, regional breakdowns, and permit data for the 40 largest metro areas in the U.S.
Canadian housing starts are broken out by province, SAARs and actual starts, single-family and multifamily. Manufactured housing shipments are a monthly update, by region, for housing shipments in the U.S.
Chip and log prices are monthly updates showing Douglas Fir and white wood sawlog prices for domestic markets and Fir prices for export markets. Quarterly updates showing average Southern Pine sawlog and chip prices by region. 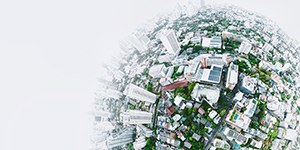 Financial indicators include mortgage rates, interest rates, exchange rates, trade-weighted U.S. dollar index, and company financial and stock price reports. Shortcuts provide a concise recap of the month’s key events that affected the industry, the markets, and your business. Import and export statistics tables and charts of U.S. and Canadian lumber and panel exports by destination and species. Also, U.S. and B.C. log exports, and U.S. imports of lumber, plywood, OSB, and logs. Retail market indicators provide a snapshot of lumber and panel activity at the retail level, derived from a monthly survey of a nationwide sample of dealers. Two tables track retailers’ sales expectations and inventory levels, broken down by region. Plus other important statistics from timber harvest to corporate earnings, are covered on a periodic basis.